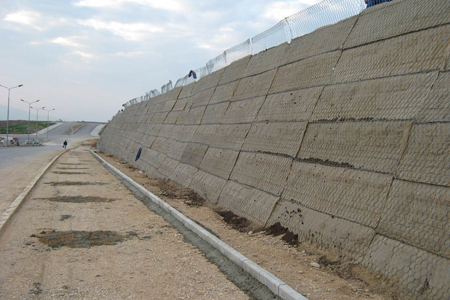 The Terramesh® system is a modular system used for soil reinforcement applications. The facing section of the unit is formed by connecting the back panel and 2 diaphragms to the main unit. This creates rectangular shaped cells used for stone confinement. The Green Terramesh® is environment friendly modular system used for soil reinforcement. 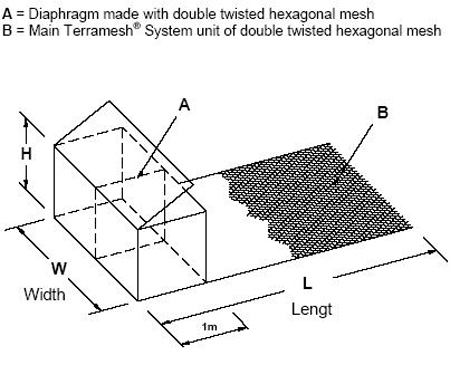 Green Terramesh® is assembled units made of double twisted wire mesh, a geosynthetic or biodegradable erosion control blanket, a welded mesh panel, 2 pre-formed steel brackets which give the slope angle. This system is used in the design in retaining structures in roads, landfills embankments, sound barriers, embankments for river protection and rockfall protection. 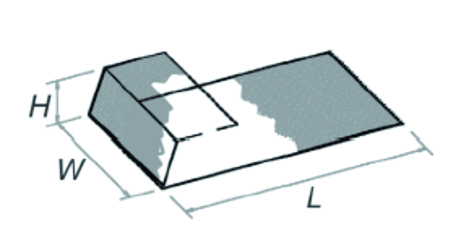 The dimensions of the units and their elements (partitions that form the angle of the slope) depend on the project requirements. The wire from which the Terramesh® unit is produced, is steel, heavy galvanized with Galmac (Zn 5% Al alloy), and PVC coated. The diameter of the selvedge wire is larger than the one of the mesh. This strengthens the structure more. Installation of the system can be easily and quickly done even by an inexperienced team which has been trained properly. The preparation of the ground is made with standard equipment. It allows easy and continuous formation of the front face of the embankment which contributes with esthetic accommodation to the environment.